Having taken the figure skating pairs bronze medal at both Salt Lake and Turin Chinese duo Shen Xu and Zhao Hongbo took time out to get married, but the double world champions are back, determined to make one last Olympic bid count. Shen and Zhao got married in May 2007just three months after the last Winter Games and only made their competitive comeback in late 2009 with the target of finally cracking that elusive Olympic title. Born in Harbin, Shen Xu began as an individual skater before linking up with Zhao when he was looking for a new partner in 1992. 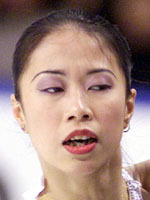 It took six years of hard work to reach the higher echelons of the sport, skating as unknowns at the 1998 Nagano Games and finishing fifth. They went on from there to win their first major title, the Four Continents championship and finishing second at the 1999 and 2000 world championships. In 2002, they put a series of lower podium finishes behind them to finally win the world title, again at Nagano in 2002, thereby becoming China's first world champions in this discipline. Some onlookers belittled their world crown, noting that joint Olympic champions Elena Berezhnaya - Anton Sikharulidze of Russia and Canadian's Jamie Sale and David Pelletier were absent, but the truth of the matter, was that they skated flawlessly. They helped silence the critics the following year in Washington, successfully defending their world crown holding off Totmianina-Marinin and Russian pair Maria Petrova and Alexei Tikhonov. To obtain such high standards, Shen Xue and Zhao Hongbo, who has already performed a quadruple salchow in training, train for nearly 28 hours a week outside competition, under the watchful eyes of Bin Yao. They were beaten to the world gold in 2004 by Russian pair Tatiana Totmianina and Maxim Marinin. Their preparations for 2005 were looking hot until Zhao picked up a foot injury in the February, which ruled them out of the Moscow hosted world championships. Perhaps lack of competition took a toll as when seeking revenge at the Turin Olympics, they were only able to place third, just behind rival Chinese couple Dan and Hao Zhang in 2nd and, way ahead on points, Totimania and Marinin in gold. But a third world title awaited them in Tokyo in March 2007. Marriage seems to have dimmed nothing of their 18-years partnership and since their comeback they have won the Chinese Cup, Skate America and, with record scores, the ISU Grand Prix final. The balance of power continues to sway with the Russian teams, but that will all count for nothing when the skating competition starts with a fresh slate at the Vancouver Games in 2010.